. . New Mexico ranches are some of the most spectacular in the country. But one spread of land there holds a special distinction. It is said that in July of 1947 a craft from another world crashed from the sky onto the Foster Ranch outside Roswell. Strewn wide across the desert grasses, arroyos and rock outcroppings lay unearthly debris from a flying saucer. Recently obtained information provides astonishing insight about what fell on the Foster fields. Two descendants of the famous ranching family have come forward to tell their stories of what they know about the event. A recently acquired federal document indicates that the government has forever barred the ranch from development. And as the investigation continues, we find the possibility of a pay-off for rancher silence! What celestial secrets do the soils at the Foster Ranch hold? Mac (sometimes spelled Mack) Brazel was the Ranch Manager for the Fosters at the time of the Roswell crash. He reported finding a large batch of unusual "debris" scattered on the grounds of the Foster ranch. The debris was apparently like nothing he had ever seen before. The nature of the material was so strange that Mac felt compelled to bring pieces of it to Loretta and Floyd Proctor, who owned an adjacent ranch. In a conversation with this author last year I asked Loretta (still active at 95) what she thought of the debris. I asked her if - over 60 years later - she still believed the debris shown to her to be special. She replied: "Yes." She said that it was not wood, it was not metal. It was not fiberglass nor any type of known material. She said: "I've never have seen anything like it before or since." I then asked, "Loretta, all these years on - with all of the advances in metals and plastics - do you really believe that the material you saw was not from Earth?" She replied without hesitation, "Yes, I really do." The debris was apparently like nothing Mac had ever seen before either. The nature of the material was strange enough that he felt compelled to bring pieces of it to the Proctors. He also showed it to the owner of Wade Bar, Jesse Wade. Mac was motivated enough by his find to report it the Roswell Sheriff, George Wilcox. 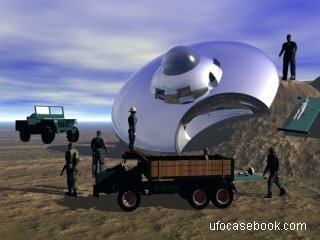 Mac also met with Roswell Army Air Field intelligence personnel to relate his discovery. It is known that Mac had stated that if he ever found anything at all like that again, that "they are going to have a hard time getting me to say anything about it!" True to his word, he never spoke publicly about the incident again. Often overlooked is that the Fosters - as owners of the ranch - had to have had a major role in the crash saga. After all, it was their ranch that was cordoned off for some time. It was their ranch to which access was restricted. Mac's son Paul Brazel (in a rare statement about the event) said that the military would not even allow them to water and feed their livestock during the recovery. According to Joe, his Uncle said, "You know what always riled me, even up to this day? Every time I tried to get to the main ranch house to water the horses in all that summer heat, the damn Army forced me off the ranch! I tried again the next day and they still threw me off our property. I was sure that they had done nothing for the animals." Paul Brazel avoided discussion with Roswell researchers throughout his life. But in discussions with investigators Tom Carey and Don Schmitt, Paul's nephew related that Paul had arrived first to the ranch to take over affairs during their father's absence (as Mac was being interrogated by RAAF.) Property belonging to the Fosters was transgressed by military. Work time and ranch profits were lost. The government had seriously impinged private property. They had sent in soldiers and equipment and had literally "taken over" the ranch for a long period of time. Ranch hands and family were removed from their own land. The Fosters (in Texas at the time of the crash) had surely been made aware that their ranch was the location of the fallen disc. Newspaper articles appearing in publications across the country must have caught there attention. It seemed likely that either Mac and/or the military itself had made the owners of the ranch aware that the property was a subject of military investigation. In fact it is now known that Mac did did indeed call his employers the Fosters to dutifully alert them to the situation. Geraldine Perkins, who ran a grocery store in Corona, indicated in a relatively recent interview that she had allowed Mac to use the telephone within the store to notify his employers of the crash. Joann Purdie agrees that something very serious and of great concern had happened at the family ranch. She said, "My Dad knew that it was a flying saucer and never changed his story. And just as the Army had warned and threatened Mack Brazel, they did the same to him." Joann encountered Mac many times after the crash. He would say nothing to her about the event, other than that it was not a weather balloon. She maintains that Mac had called her father after the crash to tell him what had happened and that military had overrun the property. She had observed how her father's attitude and demeanor had changed so drastically after the crash. She told the researchers, "Whatever he saw or heard for himself, he too did not want to talk about it after he returned home." But Purdy believes that based on what she had gathered in bits and pieces overy the years that followed, the debris that had fallen on the family ranch was not from Earth. It was material that was entirely unknown. She is suspicious about Mac's death too. And due to specific comments made to her by her Dad, she said, "I have absolutely no doubt that he believed the threats and that they meant business." Cody Derek, a Foster Great Grandson, has come forward to state that his family has known that it was an extraterrestrial craft that crashed on the ranch. In approximately 2000, after a TV show on Roswell had aired, Cody questioned his Grandfather, H.S. Foster's son (whom he called Papa) about the event. Papa acted very uncharacteristic and evasive with his grandson when questioned, so Cody dropped the matter sensing that it was upsetting to his grandfather to discuss the incident. "Those boys up there told me they were certain without a doubt that it was a flying saucer." When Cody asked if there were any pilots of the craft - bodies - found within the wreckage, his Uncle sputtered, "Uh, uh, I don't know. I can't remember." Then he said sternly to his nephew that was all he knew about that. Cody sensed that this was still a very sensitive matter with the family and let the matter drop. As so often with the Roswell story, when talk comes 'round to the bodies, it is met with silence. The United States Government had issued an edict: No development at the Foster Ranch - even today. The US Department of Interior's Bureau of Land Management (BLM) administers hundred of millions of acres of property throughout the nation. Among other administrative responsibilities, they review and approve federal land transfers and they grant authority for subsurface exploration underlying Federal, State and private land. The BLM also issues Environmental Assessments (EA's) for property. The BLM's Roswell, NM Office has recorded an assessment entitled, "Environmental Assessment for Grazing Authorization of Allotment 63020" which includes the Foster Ranch. This notation is extraordinary. It is an official federal document that expressly forbids mineral, oil, gas or similar development at the ranch. It also forbids right of way. This means that no road, powerline, fiber optic network, railroad or highway may ever be built on the land. Why is this so? What may still lie beneath Foster soils? The Foster's Great Grandson Cody Derek states that the Fosters acquired additional properties after the period of 1947. He says that they literally "made a fortune off of oil." He believes that it is distinctly possible that the Fosters were favored with property transfer of federal lands (or other types of land rights) in exchange for the family's "compliance" during the event - and to assure their continued silence on the matter. Although these favors to the Fosters could have been granted in any state, it is interesting to note that a historic review of BLM property transfer records lists eight entries for "Henry Foster" in NM for eight different properties transfers. But details of these transfers remain unavailable. They are not recorded in these records because, according to documents, they have "not been assigned for system automation." Something fell from afar at the Fosters. Their descendants - and the documents - tell us this. And whatever it could have been was buried beneath the silence of the involved and perhaps - the government may fear - the soils of their ranch.